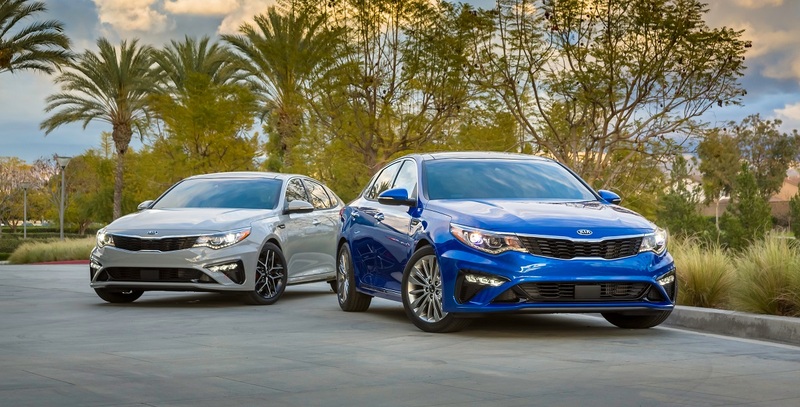 There haven’t been many changes to the new 2019 Kia Optima from its 2018 predecessor. The newer model is still just as sleek and impressive. The 2018 version of this car was quite successful in both its design and the implementation of the included features. 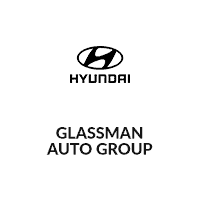 If you find that you are interested in checking out a Kia Optima, then I recommend going in person, where you can save at Glassman KIA, which is serving Auburn Hills Clinton Charter Township. Silky Silver – Available on the LX trim level. Snow White Pearl – Available on the LX, S, LX 1.6T, EX, and SX trim levels. Titanium Silver – Available on the LX, LX 1.6T, EX, and SX trim levels. Platinum Graphite – Available on the LX, S, EX, and SX trim levels. Sangria – Available on the LX, EX, and SX trim levels. Horizon Blue – Available on the LX, S, LX 1.6T, EX, and SX trim levels. Ebony Black – Available on the LX, S, LX 1.6T, EX, and SX trim levels. Aurora Black Pearl – Available on the LX trim level. Remington Red – Available on the S and SX trim levels. Sparkling Silver – Available on the LX, EX, and SX trim levels. Snow White Pearl – Available on the LX, S, EX, and SX trim levels. Platinum Graphite – Available on the LX, S, and EX trim levels. Horizon Blue – Available on the LX, S, EX, and SX trim levels. Sangria – Available on the LX, and EX trim levels. Ebony Black – Available on the LX, S, EX, and SX trim levels. Passion Red – Available on the S, and SX trim levels. 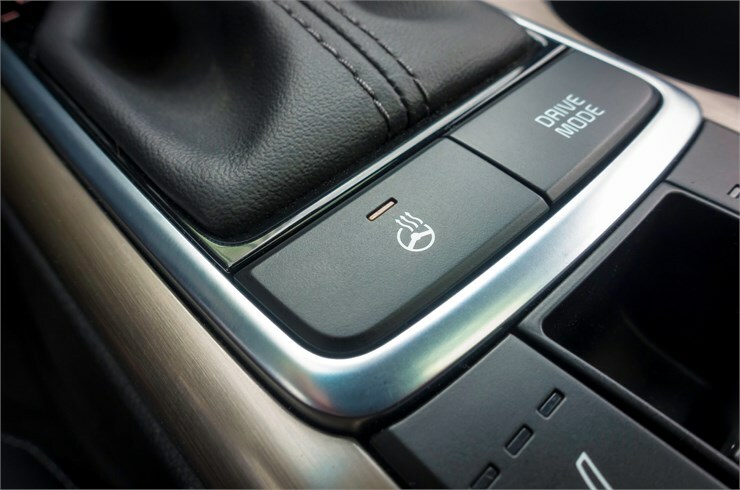 Titanium Silver – Available on the EX trim level. There have also been some changes to the interior color schemes that are available with the Optima. Here is a complete list of the interior color options, so you know what you have to choose from. LX Trim Level – Includes either the black cloth or beige cloth color options. S Trim Level – Includes only the black cloth color option. LX 1.6 T Trim Level – Includes only the black cloth color option. EX Trim Level – Includes the black leather, beige leather, and gray leather color options. SX Trim Level – Includes the black leather, ivory Nappa leather, black Nappa leather, and Aubergine Nappa leather color options. Black Cloth – Available on the LX trim level only. Brown Cloth – Available with the Snow White Pearl and Ebony black exterior colors on the LX trim level. Sport Black Cloth – Available on the S trim level only. Black Leather – Available with all exterior colors on the EX and SX trim levels. Gray Leather – Available with Ebony Black, Snow White Pearl, and Platinum Graphite exterior colors on the EX trim level. 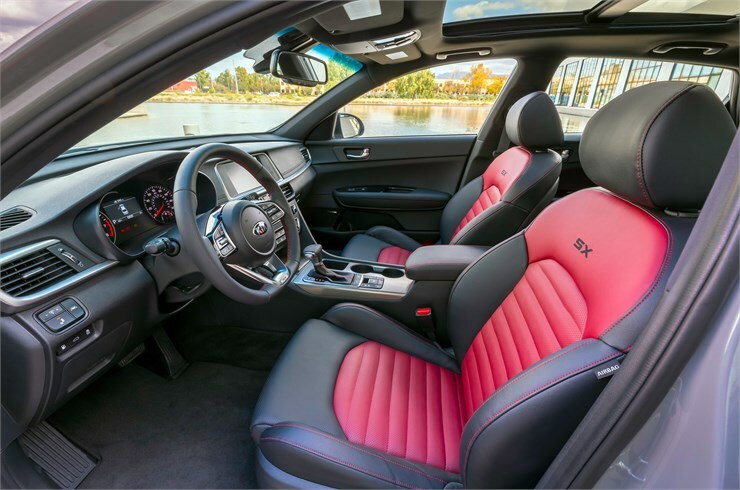 Red Leather – Available with the Snow White Pearl, Sparkling Silver, and Ebony Black exterior colors on the SX trim level. Black Nappa Leather – Available with the Horizon Blue, Snow White Pearl, and Ebony Black exterior colors on the SX trim level. Bronze Nappa Leather – Available only with the Ebony Black exterior color on the SX trim level. Aubergine Nappa Leather – Available only with the Snow White Pearl exterior color on the SX trim level. As you can see, there haven’t been very many changes in the way of the interior color options. They have moved around on the trim levels a bit, and there have been a couple new colors added, such as the Red Leather and the Aubergine Nappa Leather. 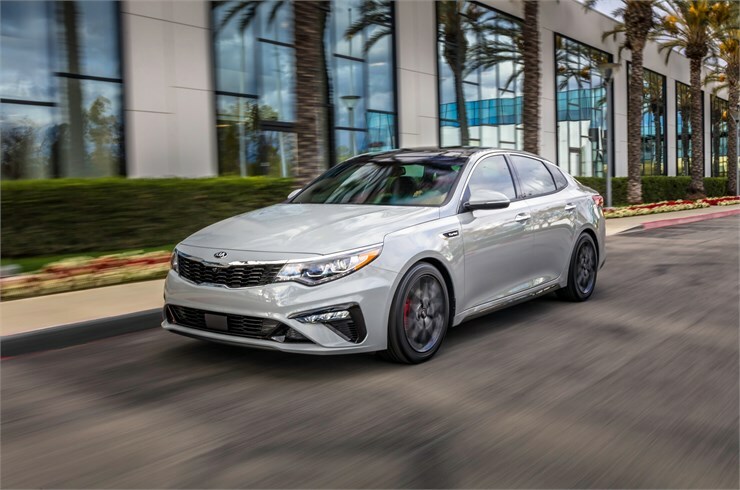 Our 2019 Kia Optima vs 2018 Kia Optima comparison also showed that there hasn’t been much change in the way of the mechanics, either. Both models still get the same horsepower, which is either 178 or 245 depending on your trim level. They also share the same sized fuel tank, an impressive 18.5-gallon capacity. One area where they differ, however, is in the fuel efficiency. The 2018 model sports a fuel efficiency of 28 miles to the gallon in the city and 37 on the highway. The 2019 model, on the other hand, is just a little bit behind with an efficiency of up to 27 mpg in the city and 37 on the highway. Both of these models share an impressive 5-star safety rating, thanks to many of the standard safety features. These include traction control, electronic stability control, a rear-facing camera, ABS disc brakes on all wheels, and the 7 airbags. If safety is a concern for you and your family, which it should be, then either of these Optimas would be excellent for you. 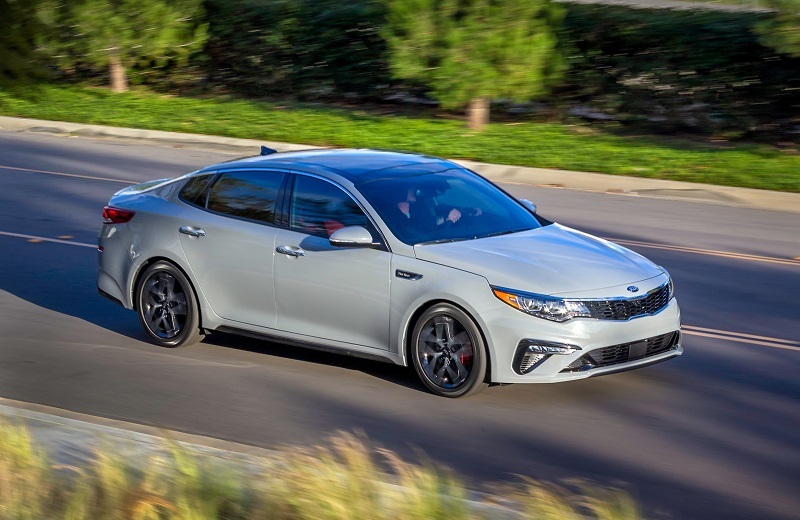 All-in-all, the changes that have been made from last years Optima to the 2019 version have been quite minor. We have seen a few changes in the color scheme, and I have to say that I love that Passion Red exterior color with the red leather interior. But don’t take my word for it, get up and go save at Glassman KIA, proudly serving Auburn Hills Clinton Charter Township.